Thanks to a recent post over on Dungeonskull Mountain, I have been introduced to an "old-school" product I'd somehow missed before now: The Official Advanced Dungeons & Dragons Coloring Album. (Don't get me started on that title.) 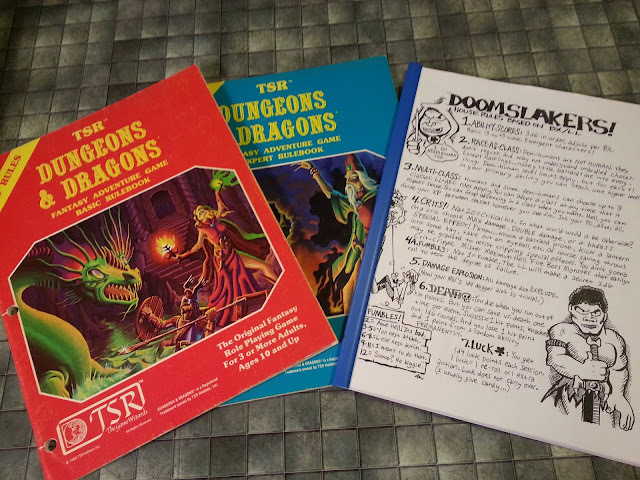 I was fairly certain until reading said post that between my physical and electronic libraries, I had every early TSR D&D product ever published. Turns out, the Coloring Album had somehow eluded my notice. The book was published in '79, which means it predates my entry into this hobby by two years. 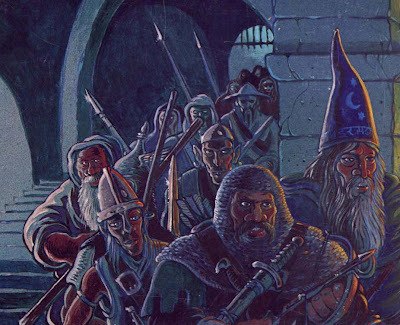 But it's chock full of illustrations that could very well have been inspired by the exploits of the parties of adventurers my nephew and I marched into dungeon after dungeon back in the day. Flipping through this beauty is like skipping down memory lane - carrying a torch in one hand and a sword +2 in the other, of course. Talk about a difference. The gulf between today's average depiction of adventurers and those of yesteryear is immense. No small, elite unit of buff, quasi-super-heroic types in this depiction - just a large troupe (small army?) of grim, determined (perhaps even cutthroat) meatbags, equipped to the gills for a good dungeon delve; some of whom* look as likely to kill their "friends" and take their stuff as they are to do so to the denizens of the dungeon. And I'm guessing that only the foremost four or five characters are meant to be PC's. The rest - the faceless horde in the back - are most likely the party's retainers, hirelings, and henchmen. Yep, this is what I think of when I think "party of adventurers." Yes! The artwork is awesomely evocative. I love the shifty, ugly, bucktoothed elves, and the vaguely Chinese-looking guy toward the back. The Coloring Album is a forgotten gem, I tell you. Glad I was able to point somebody else in its direction. @blizack: Thanks for the "tip." It's one of the greatest aspects, IMHO, of this "old-school renaissance": finding treasures like this that I had missed, or reading other folks' points of view on products that I had long taken for granted. Not only is the old-school style of play being reborn (in the literal sense of the word "renaissance") but so is my own perspective on the game(s) I've played for almost 30 years. I just dug it up about a month ago and skimmed through it. It really brings back memories of how I actually saw D&D.